Icy, slushy, snow-covered roads make for hazardous driving conditions. A wind advisory is in effect until early Monday afternoon around parts of the tri-state area. Forecasters say sustained west winds of 20 to 30 mph can pack peak gusts reaching around 45 mph. Gusts that strong can knock down tree limbs. Wind chill values will average around zero, with readings well below zero in the higher terrain. Forecasters say winds will diminish as the intense low pressure system moves farther away from our region Monday night. Commuters are facing windy conditions on bridges. The strong winds could also cause delays at airports. Meanwhile, a more than 130-mile stretch of the state Thruway upstate in western New York remains closed as road crews work to clear the highway of blowing snow. State police say whiteout conditions forced the closure of Interstate 90 in both directions around 2 a.m. Monday from Exit 46 at Rochester to Exit 61 at Ripley on the Pennsylvania border. Capt. Michael Nigrelli of the Thruway detail in Cheektowaga, outside Buffalo, says plows are clearing the highway and tow trucks are being dispatched to remove stranded vehicles. Nigrelli says weather conditions have improved and the Thruway could be reopened later Monday morning. More than a foot of snow fell on the Buffalo area over the weekend, and 30 mph winds have made for hazardous driving conditions. 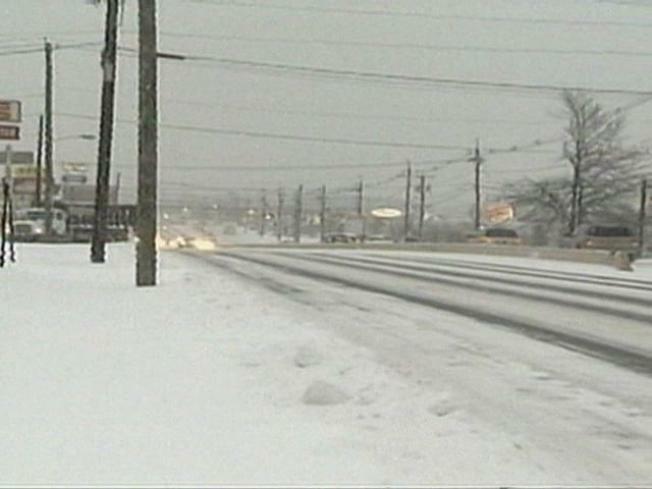 Residents of northern New Jersey and parts of New York got a second dose of snow, sleet, and freezing rain on Sunday. The weather caused treacherous driving conditions and leaving slippery sidewalks around the Garden State. An early morning four-vehicle accident on the New Jersey Turnpike in Bordentown left 17 people with minor injuries. According to State Police, it involved two buses -- one of which was a tour bus -- carrying about 90 passengers between them. A tractor-trailer and passenger car were also involved in the accident, which happened at about 6 a.m. near Exit 7 in Bordentown.